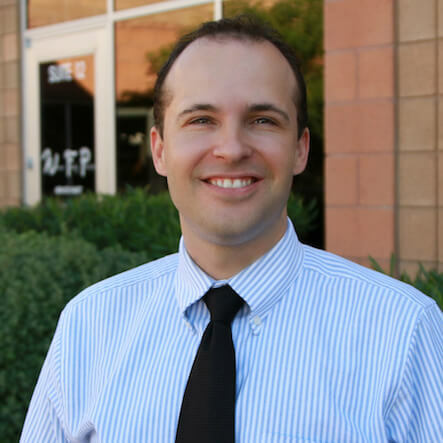 Nathan Ostler, FNP-C, began his work at Warner Family Practice in 2017. When working with Nathan, his patients experience his effort to manage more than just a health condition, but their body as a whole. Nathan grew up in Tempe, Arizona, the third of six children. Interestingly, he was raised five miles from Warner Family Practice. An avid athlete, Nathan participated in cross-country, soccer and track and field, and graduated from Tempe High School. While at a track and field event at San Diego State University where parent athletes were attempting to qualify for the Olympic trials, Nathan was jogging on the infield and nearly tripped over a prosthetic leg. It was then that he decided to work toward being a physical therapist, hoping to work with prosthetics. While working toward that degree, he interacted with a number of nurses and pre-med students, which caused him to want to become a Family Nurse Practitioner. Preventative medicine, Nathan believes, should be the basis for healthcare and health promotion. Not only does preventative health management avoid future problems, it also promotes quality of life with more time and energy devoted to enjoyable activities as opposed to health management activities. Nathan enjoys finding solutions for individuals with complex problems. He has a particular interest in vulnerable populations, people that have extraordinary challenges and limited resources to rise to those challenges. It is tremendously rewarding when chronic health conditions are minimized and people feel better about themselves, their bodies and their quality of life. Because Nathan is not a perfect man and doesn’t expect his patients to be perfect either, his goal is to develop trust and honesty to maximize health potentials. We cannot erase our past but we can create a vastly different future if we are determined and develop the knowledge to succeed. Nathan spends the majority of his free time working and playing with his children. They enjoy riding bikes, taking walks and playing kickball.